When used with unique sets of materials designed by APH, Light Boxes help students use their residual vision by developing awareness of light, color, and objects. 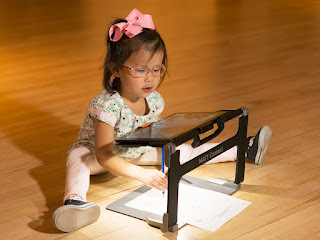 The Light Box and materials assist in the instruction of tracking, scanning, eye-hand coordination, visual discrimination, and visual perceptual skills. The newly revised Light Box has a lighted translucent white work surface, providing a high contrast background for opaque materials and a source of illumination for colored transparent and translucent items. Includes dimming control to meet the needs of individual students. The Light Box can be used flat or tilted at three angles. Built-in ledges hold overlays in position. Cool, fluorescent bulb is housed in a tough plastic body measuring 25 x 15 x 5 inches. Includes cover. Now 29% lighter, weighs 9 1/2 lbs. *Adapter accepts power from 110VAC to 220VAC. Customer must supply a physical converter that changes a U.S.-style wall plug to a plug compatible with their electrical system. Note: The appearance of the revised Light Box is very similar to the previous Light Box, the changes are mostly internal. This cousin to APH's Light Box is: -- Small and light -- Usable at a student's desk or on his/her lap Operates for 3-4 hours on included rechargeable batteries or can be plugged in with the included AC adapter. Dimming control. Low battery audio signal. Ledges hold overlays in place. Built-in combination handle / tilting stand. -- Measures 16 x 12 3/4 x 2 1/2 inches -- Weight: 6 lbs. Click this link to purchase the Mini-Lite Box. The Mini-Lite Box Carrying Case is made of tough canvas-like nylon and has roomy pockets to hold overlays and other materials. Click this link to purchase the Mini-Lite Box: Carrying Case. Mini-Lite Box Transparent Overlays Set includes one clear, four color, and a sheet of clear, flexible plastic. The color overlays may be used to promote light awareness; improve contrast and visibility; and introduce color matching. The clear overlay may be used with black and color markers. The flexible overlay offers a slip-resistant surface for acrylic materials. Click this link to purchase the Mini-Lite Box: Transparent Overlays Set. Note: Most Light Box Materials in the following three levels can also be used with the Mini-Lite Box. Light Boxes sold separately. The Light Box Materials listed below now have revised Activity Guides. These extensively revised guides now have sections on Cortical Visual Impairment (CVI), updated references to products, and increased accessibility. These versions are now produced in large print and include a CD-ROM for speech access. Level II of the Light Box Materials Activity Guide includes a number of Activity Sheets. These are no longer provided as printed pages, but can be printed out from the new CD. These sheets are in PDF format (go to www.adobe.com for a free download of Acrobat (R) Reader to open and print the PDF files). Light Box Materials: Level I -- REPLACEMENT PARTS AVAILABLE! Carrying bag Recommended ages: birth to 4 years. Click this link to purchase the Light Box Materials: Level I. Light Box Materials: Level II -- REPLACEMENT PARTS AVAILABLE! Click this link to purchase the Light Box Materials: Level II. Light Box Materials: Level III -- REPLACEMENT PARTS AVAILABLE! Click this link to purchase the Light Box Materials: Level III. The following selected items from Light Box Materials Levels I and II can be used with the Mini-Lite Box and Light Box. Sheets of activities grouped by skill accompany each item. Spinner, made of clear plastic, is used with overlays to create highly contrasting, moving patterns to stimulate visual awareness and encourage attention and visually directed reaching. Suction cup feet. Click this link to purchase the Plexiglas Spinner and Spinner Patterns. Colored transparent and translucent geometric shapes in two sizes to create displays for attracting visual attention; encouraging visually directed reaching; matching by shape, size, and color; and for introducing spatial relationships. 30 pieces in six colors and three shapes. Click this link to purchase the Plexiglas Blocks. Fosters eye-hand coordination, awareness of spatial relationships, and matching and sequencing skills. Includes 64 colored translucent pegs in three shapes and five colors for use in or out of the included 6 x 6 grid pegboard. Click this link to purchase the Pegs and Pegboard. Colored translucent pictures of 15 household objects are provided in pairs (30 cards total) for matching and identification. On clear plastic cards measuring 6 x 6 inches. Click this link to purchase the Familiar Object Pictures. Colored transparent and translucent pictures of geometric shapes for identification and matching by shape, color, and size. Thirty cards provided: two each of nine shapes, some in three sizes. On clear plastic cards measuring 4 x 4 inches. Click this link to purchase the Colored Shape Cards. Click this link to purchase the Digital Light Box Artwork: Supporting Language and Literacy.